vidic | "Name On The Trophy"
can United really afford to lose Vidic? Will Vidic be joing Ronnie at the Bernabeu ? 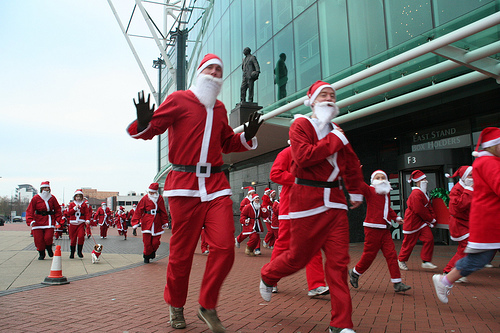 Sir Alex Ferguson’s insistence on not signing any players this summer will have been met with a collective groan from many Manchester United fans. However the United manager’s refusal to clarify that Serbian defender Nemanja Vidic will be at staying at Old Trafford will be met with more than just a groan, maybe even a scream or two. With both Real Madrid and Barcelona reported to be interested in Vidic, Ferguson when asked about the transfer speculation gave the rather inconclusive answer: “I can’t clarify it at all.” Hardly the emphatic denial United fans want to hear. 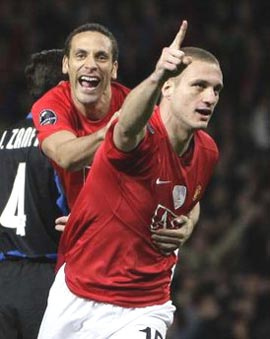 Vidic had been a rock for United since signing for the club in 2006 from Spartak Moscow for the bargain fee of £7 million, striking up one of the best defensive partnerships in Europe with Rio Ferdinand. Over the past two seasons with Ferdinand experiencing various injury problems, Vidic has managed to strike up a partnership with Jonny Evans, particularly last season, which saw United concede less goals than any other team in the Premiership. There are two major worrying factors when it comes to Vidic leaving Old Trafford- at least from a United point of view. Firstly with Rio Ferdinand’s injury problems- he started a mere 12 league games last season- United now face the prospect of Jonny Evans and either Wes Brown or the untried Chris Smalling as the new defensive partnership. While I’m a big admirer of Brown, the fact is he has also had his fair share of injuries and his most successful season for United was at right-back. As for Smalling, asking a player who’s only made a handful of Premier league appearances to come straight into the United team, is a bit much and may well lead to disaster. The second worrying element is this recent trend of United losing the crux of their 2008 double winning team. This was a side which looked as though it could go on to challenge for major honours for at least the next three or four years, without needing much changing. However since that wonderful night in Moscow, United have seen, Cristiano Ronaldo and Carlos Tevez leave, Ferdinand and Owen Hargreaves, suffer injury crisis’s and now it looks as though Vidic may be departing. Not to mention the fact that elder statesmen Edwin Van Der Sar, Paul Scholes and Ryan Giggs, can’t be expected to carry on for much more than another season or that the jury is still out for Anderson and Michael Carrick seems to have regressed. Fergie is well known for rebuilding United sides, but at the age of 68 can he really build a fifth great team, following the classes of ’93, ’96, ’99 & ’08? There is another element to this saga as well which is the attitude of the immensely popular Vidic. The words “He comes from Serbia, he’ll f*cking murder ya!” are sung regularly at Old Trafford and with good reason- not because they’re true of course I’m quite sure Vidic has never committed a homicide- probably. No, Vidic is popular because he’s a real get-stuck-in type defender reminiscent of Steve Bruce back in his heyday, he might not be the quickest but what he lacks in pace he makes up for in his reading of the game and his fearlessness in the tackle. Vidic has grown as a player at Old Trafford and it hasn’t always been a smooth progression. Against Liverpool and Barcelona two seasons ago he made costly errors in the two most important games. While the loss to Liverpool turned out to be academic- although as someone who attended that game it is still my worst memory of a visit to Old Trafford, allowing Samuel Eto’o in to score in the Champions League final all but ended the game as a contest. While there’s little doubt in my mind United were never going to win that game, as Ryan Giggs rightly stated they just: “simply didn’t turn up” Vidic’s mistake no doubt opened the door for the Catalonians. United and Fergie though stuck by Vidic, there was no real criticism for him coming from old Trafford, although many a so-called expert on Sky Sports or Match of the Day were quick to question his big-game temperament. Three successive sending offs against Liverpool only helped to pour petrol on that particular fire. Of course Vidic is under contract until 2012 and United could always take a leaf out of Arsenal’s book and simply refuse to sell him, although as Fergie has shown in the past, once a player wants to leave Old Trafford, it doesn’t take long before they’re gone.